Vegan December Holidays – vegan in your city. We’re in New York City, continuing a holiday tradition JC started when he surprised me with a trip away for my birthday in 2012, and we spent new years eve/day in Las Vegas. Then last year were spent it in New Orleans. And now this year, NYC. It spawned from one of those silly ideas where you think… where is the biggest party – where it the place people go to ring in the new year? 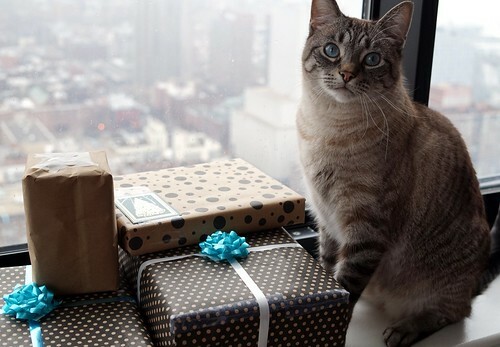 So we’re in NYC this year, conveniently staying in someone elses otherwise empty and extremely beautiful apartment because a friend of a friend that usually lives here needed someone to take care of her cat. Sometimes lucky doesn’t begin to cover it. 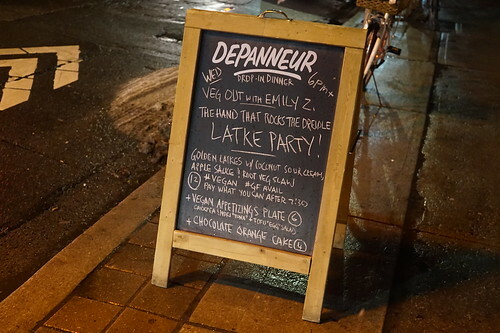 And no Hanukkah week would be complete without at least one trip to The Depanneur for one of Emily Zimmerman’s vegan latke parties. No visit to The Depanneur is complete without a picture of the outside dinner board. Plus it helps remind me exactly what everything was called. 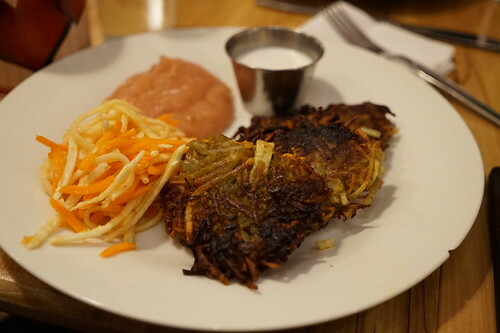 These were the Golden latkes with a really delicious spiced apple sauce, and a root vegetable slaw. I wasn’t keen on the coconut sour cream, but everything else was my jam. 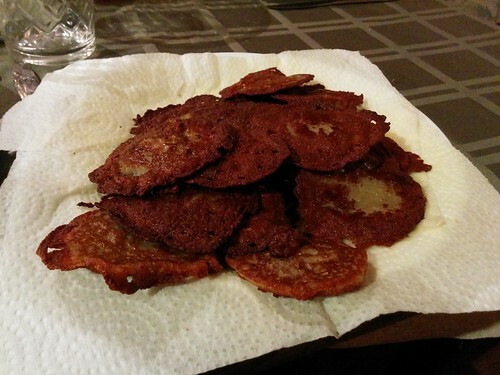 The best latkes are always the latkes I don’t make myself. Because while I can make a mean latke, even with a food processor, it’s so much nicer to just have a plate of fried potato cakes magically appear in front of me. 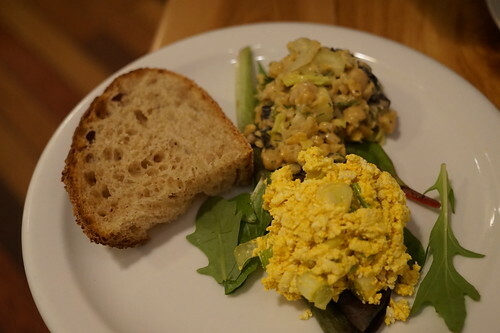 The “Appetizings Plate” with a tofu egg salad and chickpea nori tofu, and a piece of bread. This was just part of the regular Wednesday night drop in dinner – but Emily Z also held a Supper Club Hanukkah evening, but I missed it because of a late arriving train in November, but I do hope to catch it in the future (and I’ve attended in the past). We were in NYC for American Thanksgiving last month, which of course, I don’t celebrate, but it did inspire me to check in on whether they were offering anything for December – and they were. 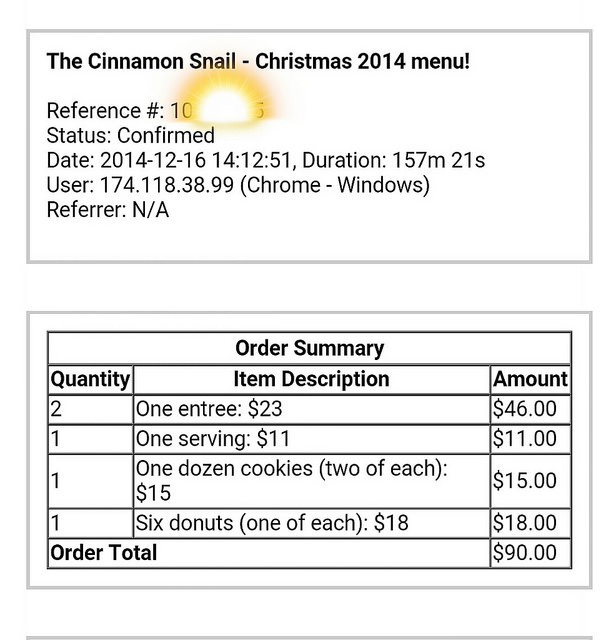 I might have gone overboard, but I ordered at least one of each – since I’ve only made it to the truck 2-3 times. And I was curious what it would be like. It felt pricy, but once we got everything it didn’t seem as bad. JC woke up early on December 24th and went to the pick up spot – it was chaotic, it was raining, and there was a HUGE line up, but he prevailed, and brought us a bag full of delicious food for later. And we slowly sampled the baked goods, and ate a bountiful plate of food in the early afternoon shortly before exchanging presents. A box of assorted donuts. 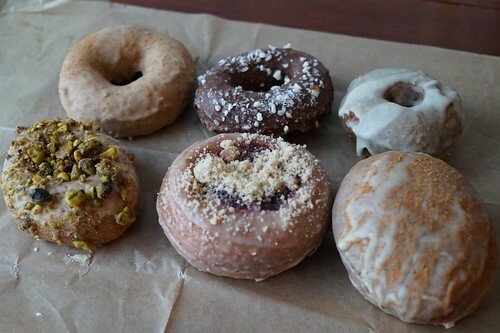 Cherry Amaretto cheesecake, Chamomile Glazed Roasted Chestnut Cake Donuts, Eggnog custard, Cardamom roasted pistachio cake donuts, Chocolate Glazed Devils Food Cake Donuts with Smashed Peppermint Candy Canes, Spiced Rum Glazed. Which sadly, we failed to eat before they got a bit dry. Many were sampled and enjoyed though. I think the winner of my heart (and JC’s too) was the Cherry Amaretto Cheesecake donut. Ooh la la. A box of assorted cookies. 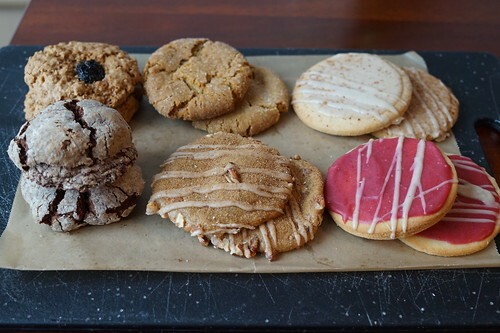 My favourite cookie was the maple ginger snap. Other cookies included in the box (that were still also delicious): Cranberry Glazed Orange Blossom Cookies, Chocolate Sabuca Cookies, Spiced Rum Pecan Cookies, Cherry Walnut Oatmeal Cookies, Eggnog Sugar Cookies. As I found out, one entree, was really more like 1.5. So we had left overs for a few days. It was such a nice assortment of flavours and colours. 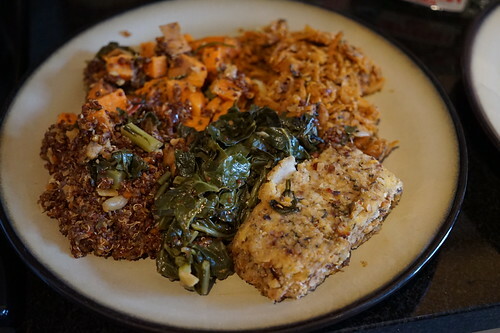 Each entree box came with a couple of roasted breaded chestnut crusted tofu cutlets, mixed garlic stewed greens, orange and cranberry quinoa, some baked diced rosemary sweet potatoes, and we also ordered the rosemary root vegetable hash, so plates were full and bellies were happy. We actually ended up bringing along a few presents with us (including a large suitcase dedicated to wrapped boxes), and in my childhood tradition, we opened presents on Christmas Eve after dinner. I have to share one gift JC got me, because I remember sitting in a vegan restaurant on our roadtrip this summer, seeing someone walk in with what initially looked like a YALE sweater… but then it dawned on me that it was in fact a KALE sweatshirt, and I couldn’t stop giggling. The unfortunate thing about this wonderful sweater, is that it has resulted in several people walking up to me or asking me what was up with the shirt. Somewhere out there, there is a picture of me and some girl in a YALE shirt, because she stopped me on the Hudson River trail for a picture. I had thought it might be fun to just casually arrange a meetup, but that ended up being impossible. 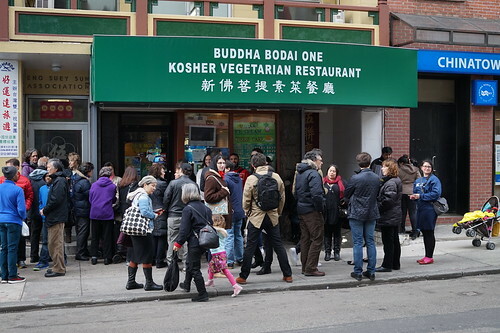 But I was glad we went there and had dim sum. It wasn’t an unpleasant wait, it was a reasonably nice day, we had walked for a few hours, and made single-serving friends with fellow Christmas Chinese Food folks. Hope you had a great holiday season too! Buddha Bodai, Cinnamon Snail, Emily Z, The Depanneur. Bookmark.